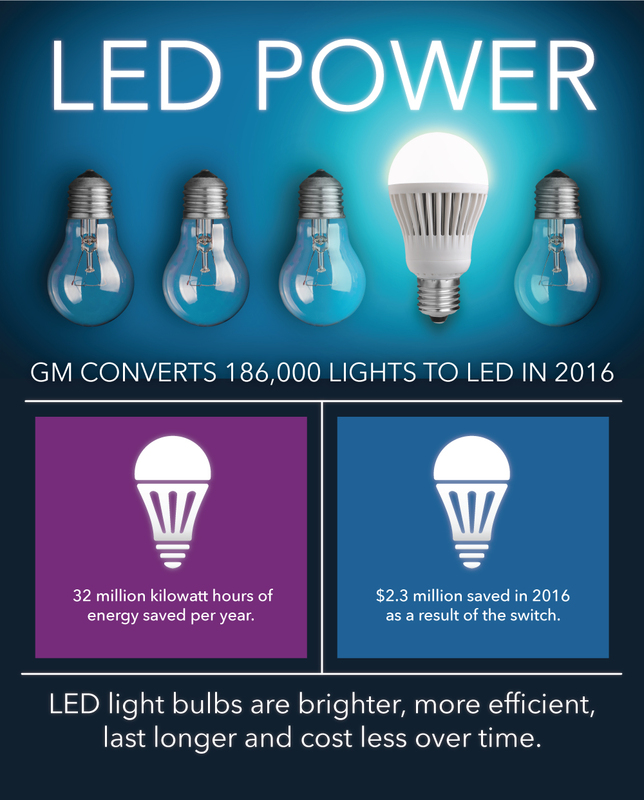 The installation of 186,000 LED bulbs and fixtures is one of many steps helping GM save $73 million in energy costs in 2016. Defiance Operations replaced fluorescent lighting with 200 LED fixtures throughout the facility. This upgrade helped Defiance reduce energy intensity by over 20 percent in 2 years. Installing 186,000 LED lights, hosting employee “energy awareness” talks and replacing roofs with white light-reflecting surfaces are just a few of the steps General Motors plants and facilities are taking to improve energy efficiency. These activities saved the company $73 million in energy costs while reducing environmental impact. While GM sites work on energy-savings projects year-round, 16 recently earned recognition from the U.S. Environmental Protection Agency’s ENERGY STAR program for their efforts. Fort Wayne Assembly Plant in Indiana installed LED lighting inside the body shop and throughout the parking lot. Lansing Delta Township Assembly Plant in Michigan installed new doors to better manage air pressure in the paint shop. Drayton Customer Care and Aftersales in Michigan optimized the heating and cooling system to use only 11 of 15 rooftop units to control temperatures in the winter. Burton Customer Care and Aftersales in Michigan leveraged natural lighting through new skylights. Grand Rapids Operations in Michigan achieved an 18 percent energy intensity reduction in part by installing new variable-frequency drives on heating and cooling equipment. Marion Stamping Plant in Indiana achieved a 14 percent reduction and engaged employees in how they can help the facility save even more electricity. Qingdao Assembly in China achieved a 10 percent reduction in part by shutting equipment down during non-production periods. Rochester Operations in New York achieved a 15 percent reduction by controlling heating systems and identifying and repairing leaks in its compressed air system. Talegaon Engine in India achieved an 18 percent reduction; improvements included optimizing the temperature of chilled water. For every degree the water temperature is raised, the plant saves approximately 2 percent of input energy. Earlier this year, GM earned EPA’s highest distinction, the ENERGY STAR Partner of the Year Award – Sustained Excellence, for leadership in protecting the environment through superior energy efficiency. GM has made a global commitment to reduce the energy intensity of its operations by 20 percent by 2020. The company is on track to meet this goal and recognition from ENERGY STAR helps motivate progress from the plant floor to the board room.